Last night, my 9 year old lost a baby tooth. This didn't strike me as such a big deal - he's been losing them (including all his front teeth) since he was 6. He, however, was thrilled. "I can't wait to tell my friends." I didn't think his friends would be especially impressed but I have never been a nine year old boy. This morning, he walked into the yard at school and straight over to two friends. Watching from a distance, I saw him say something and open his mouth. His friends peered in excitedly and one shouted "Ooh! Bloody!" I turned to go home, leaving behind a very happy boy all shored up and ready to have a great day. My son and his friends made this video as their entry for a contest. Canadian indie rock artist Joel Plaskett (we're big fans in our house) has invited folks to make a music video for a song from his Scrappy Happiness album. The winner gets a free backyard concert! This is where you come in. Please watch the video. If you like it (and how could you not - it's brilliant! ), click through to YouTube and "like" it (the like button is under the video on the left side). I know it's a bit of a popularity contest but I'm proud of these kids and think they should be encouraged (and not just because I'm Sacha's mother!). This image has been appearing as a status update all over Facebook. It really bothers me, and I can't even really articulate why. I think part of me just finds it silly - do we really all think that 97% of our friends won't repost and that only 3% will. ?Where do those numbers come from? The message also implies that if you don't repost, it's because you really don't hate cancer - that you are apathetic or worse. But posting a statement that cancer is bad, is not an act of activism and affects no real change. 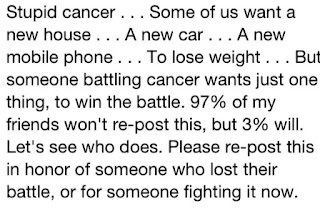 In addition, I'm bothered by the statement "all someone battling cancer wants...". Really? 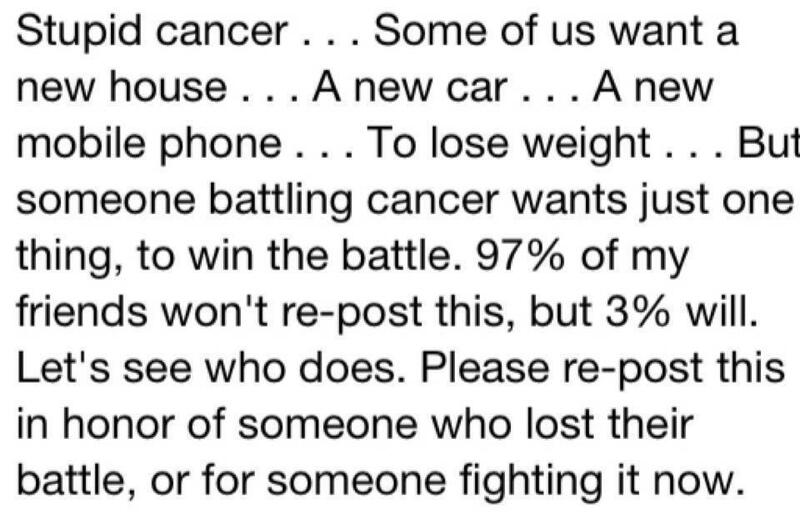 You think that's true of every single cancer patient? As an individual person living with cancer I have wanted a new mobile phone and dreamed of fixing up my house. I've also wanted a dog, for my kids to do more around the house, to travel and be able to watch something good on TV on a Friday night. While I've struggled with my health, I have remained a whole person with complex wants, needs and desires. The illness hasn't changed that. Finally - and I know this doesn't apply to all of us with cancer - but I don't like the "battling" and "war" analogies, especially when we go on to say someone has "lost" or "won" the war. It's not true that only the fighters and the strong survive. And it's certainly not through that those who pass away just didn't fight hard enough. I know that the people who post this status update have big hearts and are very well intentioned. I don't want to sound mean-spirited or ungrateful. I just want to let you know that this cancer patient would prefer you did something else. Something real. Something more.